The U.S. bank prime rate remains set at 3.25 percent. In a year that saw inflation all but disappear and mortgage rates fall, credit card rates were something of an oddity. 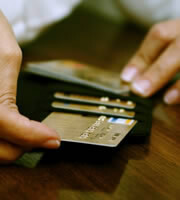 Four out of the five categories of credit cards tracked by the IndexCreditCards.com survey saw rates rise over the course of 2014, and the one exception was because of a change in the constituents of the student credit card category, rather than a drop in the rates of any particular offer. The general trend toward higher credit card rates is inconsistent with a low-inflation environment, and says something about either creditworthiness concerns, market demand for credit, or both. Business rewards credit cards experienced the biggest rate increase among the categories tracked by this survey, with rates climbing by 31 basis points over the course of 2014. Even that is not a very big increase, but what makes the rate increases in four out of five categories stand out so is that they occurred within a context that should have been ripe for lower rates. Essentially, credit card rates consist of three things: an inflation cushion, an allowance for credit risk, and a profit margin for credit card companies. According to the latest Consumer Price Index release, the year-over-year inflation rate has dropped to just 1.3 percent, so rising credit card rates are most likely a function of heightened credit concerns and profit motive. With demand for credit having risen over the past four years, these trends may well continue in 2015. Consumer credit card rates were unchanged in the latter half of December, and the category overall rose by 18 basis points in 2014. Rates on rewards credit cards rose more than those on non-rewards cards, by a margin of 23 basis points to 8 basis points. This increases the potential cost of rewards programs for consumers who incur interest charges on their credit card balances. After remaining unchanged for most of the year, the average rate on student credit cards dropped in the final survey of the year. However, this was because one of the credit cards included in the survey was discontinued, and was replaced by a card with a lower rate structure. While this does not represent an actual reduction in rate by any particular credit card company, the availability of cards with higher or lower rates can be an indication of which way the market is heading. Also, the difference made by changing one card in the survey can help teach students a valuable lesson about this market. Rates vary significantly from one card to another, so consumers who take the time to shop around can save money with each credit card bill. Rates on business credit cards were unchanged in the last semi-monthly survey of 2014. As with the consumer category, rates on business rewards credit cards rose by more than those on non-rewards cards, which can represent an additional potential cost of participating in rewards programs. With no change in consumer credit card rates in the latest survey, the spread between the average rate for consumers with excellent credit and the overall consumer credit cards average remained unchanged at 4.06 percent in the latest survey. Over the course of the year, this spread widened by 13 basis points, which may be an indication that growing credit concerns were at least one factor in rising credit card rates in 2014. 0 Responses to "Rising demand for credit may drive rates higher in 2015"